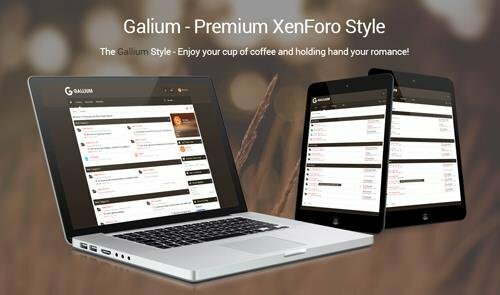 There are always new freebies ready for you to enjoy from DohTheme and again we are publishing our first free xenForo 2.1 theme.We have included about 50% of our framework which we're using in paid themes so you will get great style options. I have nothing to say but leave you the demo link but before I go, I would love to hear your feedback. Hit reply and let me know. Nubia is our latest xenForo 2.1 theme. Its vibrant and colorful, yet clean design gives it a stylish and trendy look. Since this theme is mostly based on options and properties, modifying it to suit your needs has become a real a piece of cake.it comes with 4 different node layout and dark theme to choose from, which gives it that extra touch. Theme BORX based on modern trends of design and focused on community games theme. A large number of settings are available for full customization of the style. Selected fonts and colors are perfect for gaming forums, beautifully displaying all the content on your site. 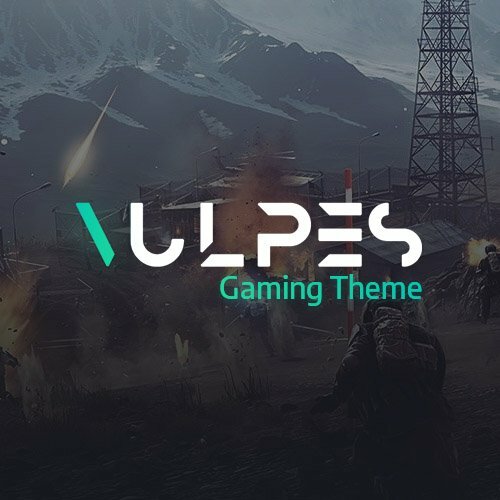 Vulpes is a new unique theme in darkcolors and gradients. Can be used for any forums. Have a lot of settings and you can fully customize it. Version 2.0 is based on my new framework. Now you have a lot of theme settings. Customize header, navbar, slider, articles, popups, comments, forms and more! 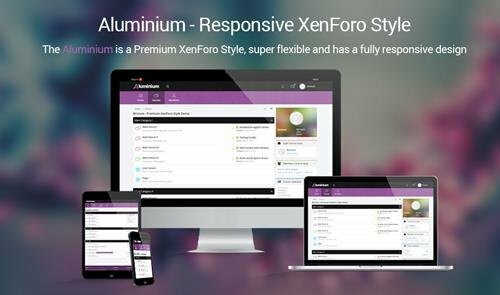 There are always new freebies ready for you to enjoy from DohTheme and again we are publishing our first free xenForo 2.0 theme.We have included about 50% of our framework which we're using in paid themes so you will get great style options. I have nothing to say but leave you the demo link but before I go, I would love to hear your feedback. Hit reply and let me know. 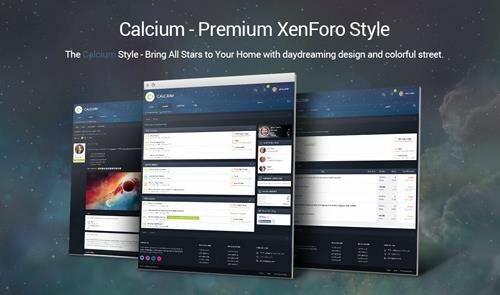 Nubia is our latest xenForo 2.0 theme. Its vibrant and colorful, yet clean design gives it a stylish and trendy look. 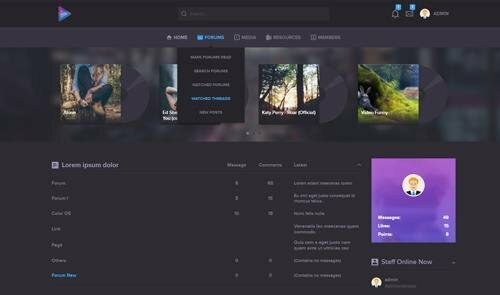 Since this theme is mostly based on options and properties, modifying it to suit your needs has become a real a piece of cake.it comes with 4 different node layout and dark theme to choose from, which gives it that extra touch. This is the first time we introduce grid view for the navigation menu bar in a style instead of traditional list view format, which means the other tabs like Home, Forum,... are hidden behind the main tab. You must click on the main Tab to open the other main tabs. This kind of view will bring to you the sense of overlapping at first, but look a deep side, you might feel the neat when the page is presented like that. 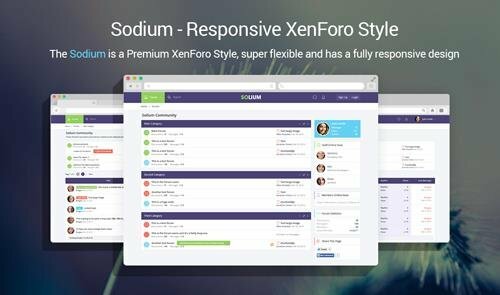 Sodium style for XenForo 2, with the traditional flat design, means that it's totally fresh with a mixture of bright green and dark powder blue. In the 21st century, when new technology is reigning, while the human is witnessing the development of the explosion of the digital era, they immersed search for themselves for a browser which could completely change the surfing habits. And at that time, Google Chrome was born. People have used it everywhere in the world instead of using Firefox or IE. 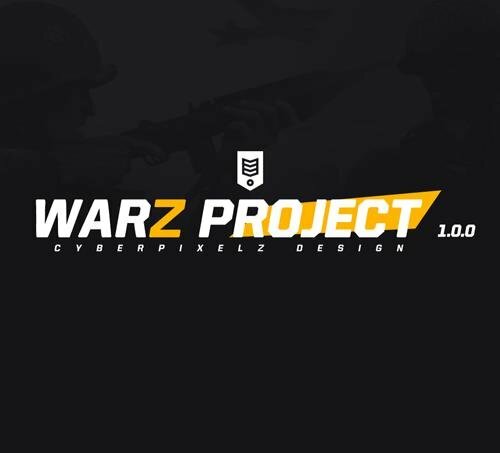 However, just a little people know that its project called “Chromium”. 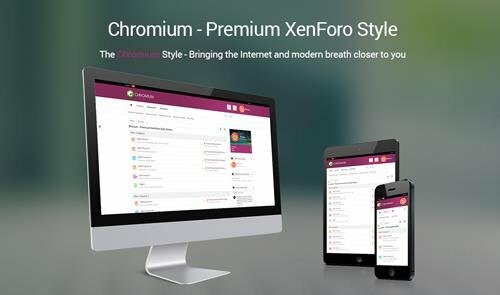 We issuance this style “Chromium” for XenForo 2 based on some characters of Chrome. They are very fast, with modern design, figurative and emotional logo system which can melt any web surfers. With two main colors, violet and white background, we hope to give you the best experience for it. Aluminium is special style with violet color - It's a kind of flower which represents for Aphrodite God - The Goddess of Love and Beauty. With a transparent navigation menu bar, you could see it easily through that our background. The text font is still kept simple but bold and clear. The name "Aluminium" was inspired by Aluminium - a chemical element which is the third most abundant element (after oxygen and silicon), and the most abundant metal in the Earth's crust. We hope that we have given you a wise choice for your site! It is a silvery white, soft, ductile metal. The word “Selenium” comes from Greek, "selene" means moon. This naming is related to the reflection of selenium which is multiplied 1,000 times when selenium was brought from the darkness into the sunlight. 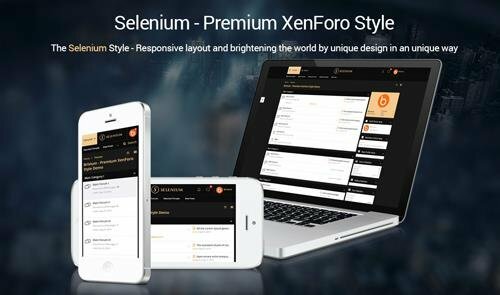 By this inspiration, we created Selenium style for XenForo 2 with a dark background - The Black color and with each of small navigation box, it shades yellow color like the color of sunlight. By listing all the menu by dropping down them, you could switch between tabs by clicking into the main Navigation and then choosing what you want to go. The Search Box has been added underneath the menu and you could find out the recent post easily by clicking into the box next to Search Box. 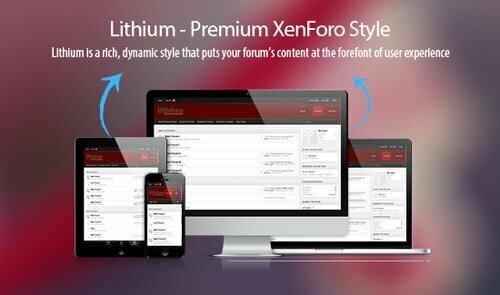 Let's take a glance looking at Lithium for XenForo 2 Style. At the very first moments, you could feel that you are falling into a pool of red wine. We created it by 2 main colors: red color of plums and yellow lines with uneven thickness. It all brings down 3-dimension space and regal feelings of the king sat on the throne at the ancient times. On the other hand, the background and text font are keeped as simplest as it could be. Incorporating all of those details, the style could highlight and bring down all of your content under the users' eyes. 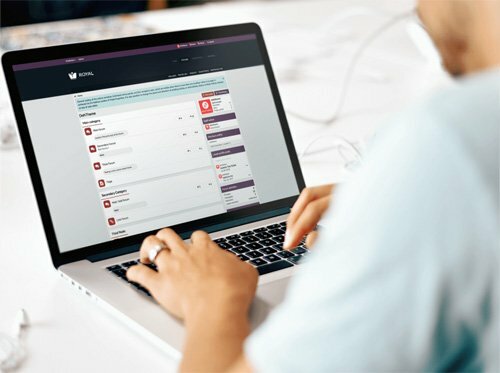 Treat all your users like with your God! Zirconium Style is created under the name of Zirconium element. 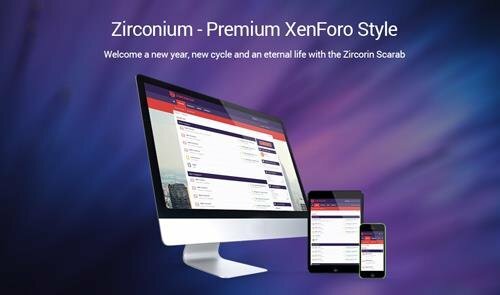 Zirconium is a chemical element with symbol Zr and atomic number 40. The name of zirconium is taken from the name of the mineral zircon, the most important source of zirconium. The word zircon comes from the Persian word “zargun”, meaning "gold-colored". From old days, the ancient Egyptians used to make Zircon mineral to jewelry, when peeling, sanding, grinding, the stones turn into “gold color”. Being affected by the culture of ancient Egypt, the symbol of Zirconium is a scarab. Scarab is represented by the God of Sun Khepri related to the revival. Scarab species usually lay eggs in the feces of other animals, roll them up like balls and roll into the hole, mean the beginning of the life cycle of a little scarab. Egyptians compare this behavior like the movement of the "sun ball" rolling across the sky and its daily rebirth. The ancient Egyptians believed that “a scarab” flying in the sky each morning will call up the sun. Scarab is therefore a symbol of the rising sun, is used to protect against evil, it is also a symbol of rebirth, creativity, change, giving strength to the wearer. Big wing Scarab and big heart-shaped Scarab are considered as the luck and placed on the mummy to protect people from evil. When Pharaoh Amenhotep III died, hundreds of mementos shaped Scarab was made to mark the milestone events in his life. Technetium - XenForo 2 Style is created by 3 main colors “green - black - white”, green for header and footer, black for background and white for the billboard. Just a harmony, you see? 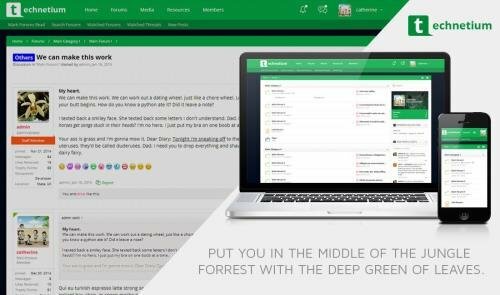 All you need is sitting down, browsing the site with Technetium style, and imagine that you are in the middle of a jungle forest, it could be fun anyway! Brivium today will represent to you a new style that we work together to get it done. This style was named after the name of Promethium - the lost element found in 1902. The name Promethium was also started from Promethius, a giant Titan who stole fire from the God Zeus to share it with people on Earth. Promethium Style was designed with the strong basic dark background. The control bar provides users with normal categories like Home, Media, and Resources. 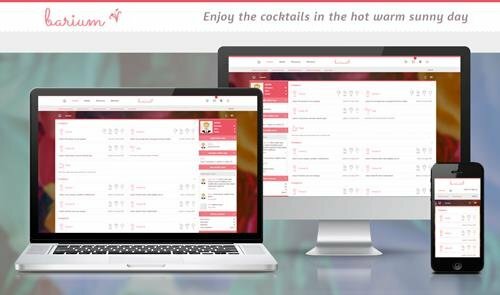 So from anywhere on the site, you could click and access the board functions easily. 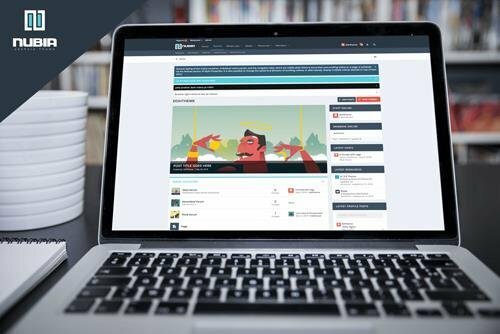 In the Media, you could access to tons of resources such as films, pictures and other photos, which allow the members and users of the forum to upload and adjust by themselves. The rational allocation of toolbars and well-structured design of the style help users to experience a stunning website with surfing smoothly. Overall, we encourage you to try this new style and give us feedback on your experiences. Any comment will help us to complete our product better. With "Calcium Style", you could feel that you are lost under a beautiful night sky with full of stars. Navigation menu was designed transparent color to help you can observe through the night! Under this wonderful sky, you could choose for your site any "sightseeings", such as a street lights or a lot of high building at a modern city. You will fall into a half way point at a universe where you can experience the absolute silence of space, while "under down there", your forum is very crowed! Yttrium is a dark style for XenForo 2 which inspired by Yttrium element. Yttrium is a chemical element with symbol Y and atomic number 39. It is a silvery-metallic transition metal chemically similar to thelanthanides and it has often been classified as a "rare earth element". In 1787, Carl Axel Arrhenius found a new mineral near Ytterby in Sweden and named it ytterbite. Elemental yttrium was first isolated in 1828 by Friedrich Wöhler. And the flag of Sweden is dark blue. By those inspirations above, we created Yttrium style with the dark blue as the main color. The navigation bar is adjusted to the dark state blue, similar to the dark blue. By doing this, the whole style is dark. So we choose white color for the color of text. 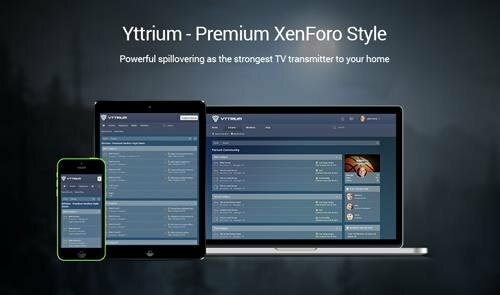 Moreover, Yttrium is the symbol of TV transmitters, so we hope that it will bring the best signal to your home. Barium Style is named as the Barium element in the Mendeleev’s Chemical Table. We choosed the main color of this style as the pink and red one. With somebody who loves the warmth, enthusiam of the young lovers, there is nothing as great as one day, you can enjoy the sunny right in your site just with this style. The style is a colorful party with the most amazing symbol system of attractive drinks. We hope that you can lay down somewhere in a beautiful beach and enjoy your business by our design!